I'm Running to Eat! : Where did it go?!?!?! I'm on a roll! I ran three miles yesterday with a friend (who pushes me and keeps me honest! LOL!) and I'm off this afternoon for a long run in the park with my Running 201 group. I'm really struggling with consistency this fall. Hopefully that will get easier if I can keep this up for a couple of weeks. The cooking is going much better. But I can't believe I've managed to lose my favorite recipe for a quick and delicious lunchtime soup! I've searched all over and can't find it. Now that the weather has finally changed, I was in the mood for a warm bowl of soup this morning and couldn't find it anywhere. I didn't even have any luck trying to Google it. I made this a couple times a week last winter. ::sigh:: I tried to wing it but something was missing. I just can't put my finger on it. Any ideas? I think the original recipe came from a book called Dinner Doctor by Anne Byrn. 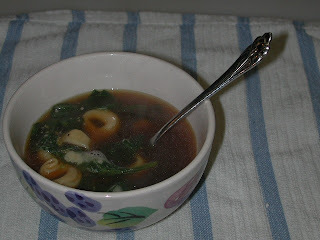 It's a Cheese Tortellini Soup with a ginger-flavored broth. Bring stock and ginger to a simmer. Add tortellini and simmer 3 minutes. Add spinach and stir until wilted. Add pepper to taste and top with grated parmesan cheese.